Graham Rooth MD, MRC Psych, is a retired consultant psychiatrist with a longstanding interest in languages, and the relationship between spirituality and humanistic therapies. His recently made a new translation of Hubert Benoit's The Supreme Doctrine, published with other Benoit publications in The Light of Zen in the West (Sussex Academic Press, 2005). Provides comprehensive coverage of the key concepts employed by Guénon and interprets the less familiar terms from Sanskrit, Hebrew and Arabic. The text makes extensive use of extracts from Guénon’s original work. Graham Rooth is the translator of the bestselling The Light of Zen in the West, incorporating The Supreme Doctrine and The Realization of the Self, by Hubert Benoit. René Guénon is a major figure for anyone who recognizes a need to rediscover the spiritual roots from which Western society has become so comprehensively alienated. Immersing himself in the search for spiritual truth, he chose Islam as the vehicle for his spiritual life. Settling in Egypt, he clarified and deepened our understanding of the teachings of traditional metaphysics, his central message being that there is at the source of all humanity’s traditions a ‘Primordial Tradition’ – a Universal Metaphysics which sets out the principles that underlie this Tradition. The truths it embodies are universal and unchanging, and form part of a unified body of higher knowledge which transcends the multiplicity of religious dogmas and philosophical systems that abound in Western society. He wrote about the need to transcend the formal and emotional aspect of religion in order to prepare ourselves for an understanding of ‘pure metaphysics’. He explained how traditional societies achieved this, exploring the symbols used, in order to help individuals forward to levels of understanding which are otherwise inaccessible to minds blinkered by the limitations of the currently prevailing Western approach to existence and its meaning. This book provides an overview of Guénon’s work. It is arranged in four parts each of which provides extracts that express his views directly and commentaries that summarize or paraphrase his written work. The objective is to allow Guénon to speak for himself rather than produce a critique of his ideas. Part One, Religion and the Primordial Tradition, explores Guénon’s ideas about the nature of the primordial Tradition or ‘Perennial Philosophy’ and the part it would play in a traditional society. It sets out his views on the major religions and how they are related to the primordial Tradition. There are sections on the monotheistic religions and the oriental religions. The largest section deals with Vedantic Hinduism, reflecting the dominant and enduring role that this played in the development of Guénon’s ideas. Part Two, The Spiritual Journey and the Integral Being, focuses on the quest for enlightenment and the means of achieving it, with an emphasis on the role of initiation and transmission. It examines the difference between ‘realization’ and salvation. It explores the spiritual quest in the light of Guénon’s theory of the integral being and its multiple states, which postulates that the human state is one aspect only of innumerable different states comprising the totality of a single being. Part Three, Western Society and the Growth of Modernity, presents Guénon’s critique of contemporary Western society in terms of its historical development and current worldview. It highlights the spiritual dangers that confront the West and examines the processes and attitudes symptomatic of its spiritual decline. It provides an overview of Guénon’s ideas about subjects ranging across the sciences, the humanities, philosophy and psychology. The section on philosophy draws together many of Guénon’s ideas about the nature of manifestation and ultimate reality. Part Four, Symbolism, explores the significance Guénon attached to the history and meaning of the symbols shared by all the great traditions. It summarizes his thoughts on the nature of symbolism, how it achieves its effects and its particular significance to the spiritual life. Many examples are provided from the natural world, the animal kingdom and human activities, demonstrating the important part played by symbols in all cultures, and the common features they share, suggesting the possibility that many of the more important ones point to an ancient, common origin. The works of René Guénon (1886–1951) are the focus of this book, presented in translation with commentary and a glossary for unfamiliar terms. The title is divided into four sections of work: religion and the primordial tradition, the spiritual journey and the integral being, western society and the growth of modernity, and symbolism, with each section providing extracts of Guénon (1886–1951) are the focus of this book, presented in translation with commentary and a glossary for unfamiliar terms. 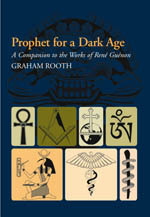 The title is divided into four sections of work: religion and the primordial tradition, the spiritual journey and the integral being, western society and the growth of modernity, and symbolism, with each section providing extracts of Guénon’s work with observations and summarizations by Rooth. Although all of Guénon’s books and most of his articles are available in translation through the Sophia Perennis Press, his work remains largely unknown in the Western world; this title attempts to bring the tenets of ‘Guénonian traditionalism’ to a wider audience.